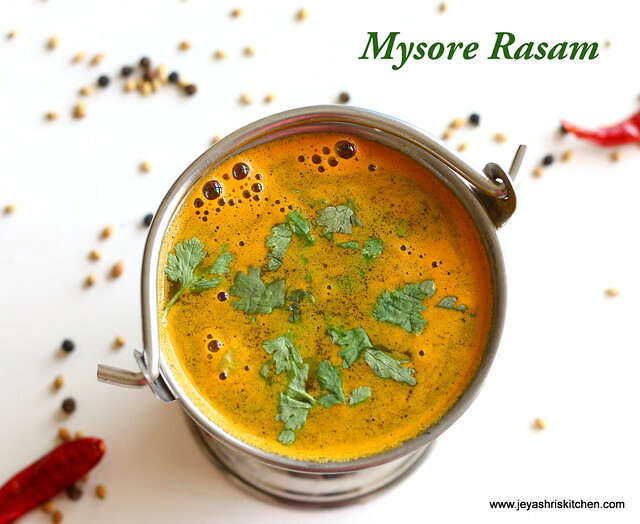 variations like kalyana rasam, pineapple rasam or my mor rasam recipe for a unique flavour. Dry roast the ingredients in the above table except coconut and grind this into a fine paste along with coconut. Puree the tomato and transfer it a vessel. Add the tamarind extract, salt, sambar powder, asafoetida, turmeic powder and boil this for 7-9 minutes in medium flame till the raw smell goes off. Add 2 cups of water to the cooked dal and add in the ground paste to this and mix well. Transfer this to the boiling tamarind and tomato mixture. When it froths up switch off the flame and garnish with curry leaves and coriander leaves. Temper mustard seeds in ghee and add to the rasam. A tsp of jaggery can be added at the end. mmmmmm............looks wonderful ! cant wait to try it out! always love rasam and that too made in iya sombu ...missing it badly ...loved ur presentation ..
Super comfort rasam !!! Delicious !!! A doubt - you have mentioned sambar powder in the ingredients. Then you also give a paste that needs to be made. Please clarify! looks really appetizing and delicious! 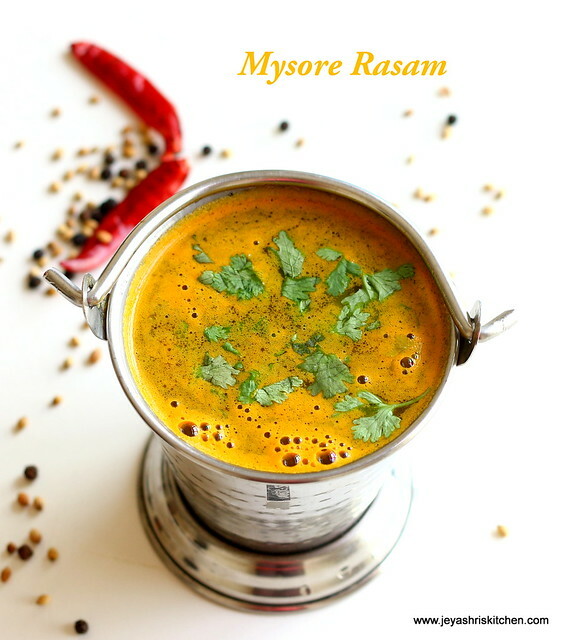 I absolutely love rasam and this looks more delicious that how I prepare. looks yummy my fav....nice clicks jeyashree. wonderful aromatic rasam.. love that u hv prepared with chombhu..
superb! I could smell it here! :) One day you got to make this for me okay? ;)No kidding! Rasam is always my favorite!!! Love this Arachuvita rasam, for the flavors it has got!!!! This looks delicious, have saved for another day. Love the flavourful rasam...lovely clicks! 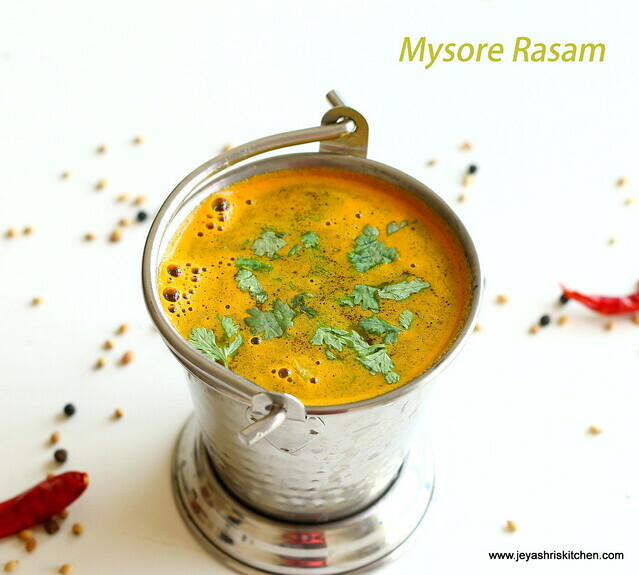 Wat a comforting food,nothing will beat this flavourful rasam..
Lovely with steamed rice n perfect for digestion!! Very flavorful and yummy rasam..
truly delectable! the virtue of tradition is something u cannot sacrifice.. This one looks so yum,.perfect with some plain rice,.. I have just heard about this rasam. Will make it my kids will love it. Jaya madam .This rasam is amazing.I tried it today .My husband likes it alot..
Made this rasam with brinjal curry. Wonderful . My aunt suggested this site after seeing it in the Hindu from India. Great job. Please keep posting more recipes like Aappam etc .. This is the first time I tried from your blog!! truly amazing!! Came out yumm!! Love the way of illustration along with the step by step pics!! :) admire your passion and patience!! Yummy rasam...prepared it many times..a fovourite for the whole family.Thanks alot Jeyashri mam,I hav made all of ur rasams!! I tried this recipe today. It was delicious!!! Thanks for sharing.